Union Station passengers have been feeling an extra squeeze as of late with its ongoing renovations. Construction has included a new passenger lounge and extensive work to the vaulted skylight. More than 34 million Metra passengers and more than 3 million Amtrak passengers used Union Station last year. 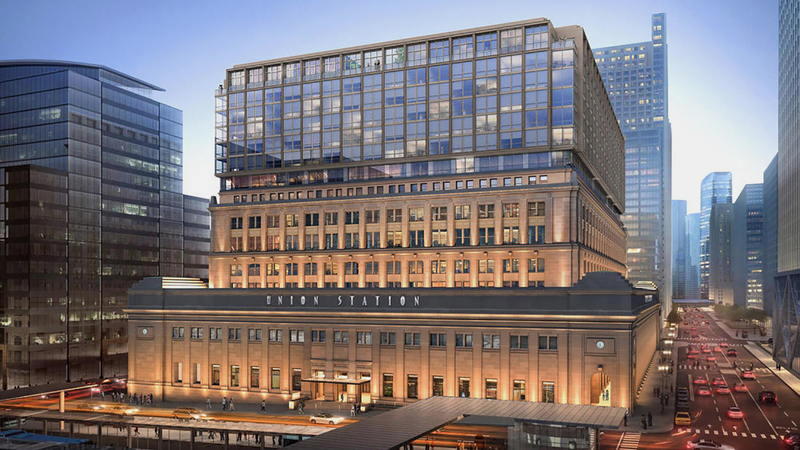 A new plan for a $1 billion redevelopment was announced Monday and would add 330 hotel rooms and more than 400 apartments atop the existing station that was completed in 1925. Joining us to talk about the new Union Station redevelopment plan is Blair Kamin, the Chicago Tribune's Pulitzer-prize winning architecture critic. Tell us about the Union Station proposal. So, we have two developers Riverside and Convexity, both from Chicago, proposing a renovation and expansion of the Union Station. And it has two main parts. The first is to put a 330-room hotel on the upper floors of the historic train station. The second part would build a seven story addition and 404 rental apartments on the roof on top of the existing Union Station. The other parts of the proposal involve a 1.5 million-square-foot office building that would be built on a block to the south of the train station. And changes to the station itself around ground level involves new entrances on the west, north and south sides that would enable people to move more easily through the station and into the hotel and apartments at its upper levels. Cross-section renderings of the proposal show the skylight area will be open. Correct. The seven story addition is essentially like a rectangular doughnut. It retains the light well in the center of the building. So that is why you see that these are not conventional floors. They retain the basic shape of Union Station below. Was this part of the original plan from the last century to have something built on top? Yes. The original architects of Union Station plan for an office tower on top of the existing station. It would have been about 20 stories tall. But it was never built. You wrote in Daniel-Burnham-speak that these plans are “little. Very little.” Is that about melding the old with the new? Yes. It is about the really incompatible relationship of the seven story addition to the existing Union Station. The architects are trying to create a design that they say would be compatible with, yet distinct from the addition. But in this case, the addition is not compatible in the least with the existing Union Station. It's top heavy. It is a grid, a metal and glass grid that is not compatible with the carefully composed classical design. It has none of the grandeur of Union Station. It has kind of all the grandeur of a Holiday Inn. The proportions are bad. Apparently this is an improvement on earlier elements from the same architects and it's hard to imagine what those were. It's hard to imagine that they could be much worse. What do you like about this proposal? Well, there are good things involve the — at ground level the way that the proposal invites people to walk through Union Station more easily than they can now. For example, on the west side of the station, you're greeted by blank walls, blank windows. The renovation would punch an opening into the west side right in the middle of the elevation and so you'd be able to enter Union Station much more easily from the West Loop and that would feed people through the Great Hall, that kind of soaring but kind of forlorn space at the center of the historic Union Station. That might also feed some customers into the shops that would be located around the Great Hall. But at the same time there have been plans for a food hall there and we didn't really hear any elaborations about that. The point is why would anyone go to Union Station other than to just get a Metra train home or an Amtrak train to Springfield? There's got to be some buzz, some excitement to the retail mix here and so far you know we're not seeing any of that. They want to start construction in the spring. But what's next zoning board, public input, re-design? Well, Ald. Brendan Reilly has begun a community review process. Then the proposal would have to go to the Commission on Chicago Landmarks in some form. Then it would have to go to the City Council and ultimately, it's really up to the Ald. Reilly and [Mayor Rahm Emanuel] whether this will be approved and hopefully they will request changes. They really should. Because Union Station is an emblem of, and a gateway to the city of Chicago and this proposal is not worthy of that of that status.